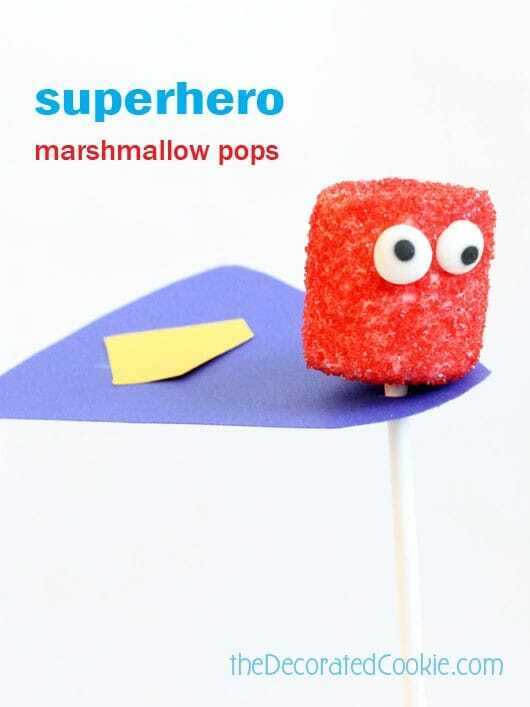 Recently I emailed a bit with a reader asking about Superhero marshmallow pops. 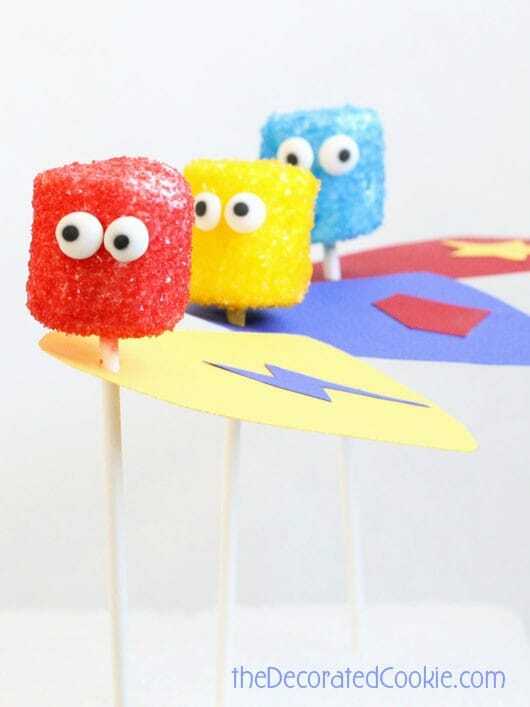 Specifically, Teen Titan marshmallow pops. I hadn’t seen the show and moreover, I realized I was woefully short on my superhero stock. Are these bite-size Superhero cookies all I have? Egads! So these gals (yes, these are gals, but they can be guys, too, if you like, but really, we kind of do everything) are to remedy the problem. 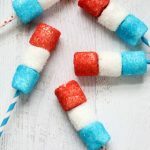 You might also like this roundup of Wonder Woman food ideas or Wonder Woman popcorn. 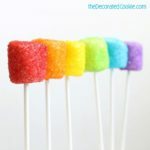 They are ridiculously simple to make. 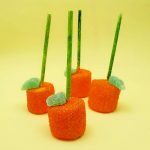 I used my oft-repeated how-tos to coat marshmallows with colorful sprinkles , and added candy eyes. Note these superheros aren’t masked. It’s not that I couldn’t think of an easy edible way for them to wear masks, it’s just that they have nothing to hide. Yeah. That’s it. I’m going with that. 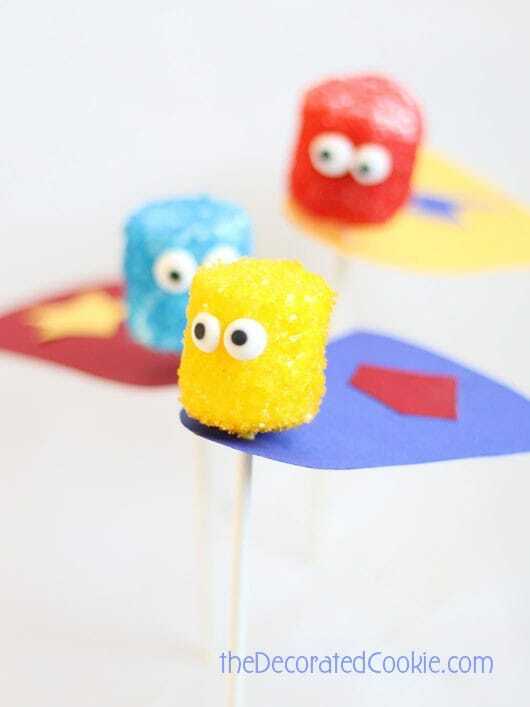 *Find the lollipop sticks, sprinkles, candy eyes and card stock in the craft store. You want the lollipop sticks to fit snugly in the capes, so my hole punch is only 1/8-inch. If you don’t have a punch that size, just use a needle or the tip of the scissors. 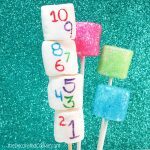 Skewer marshmallows with the lollipop sticks. 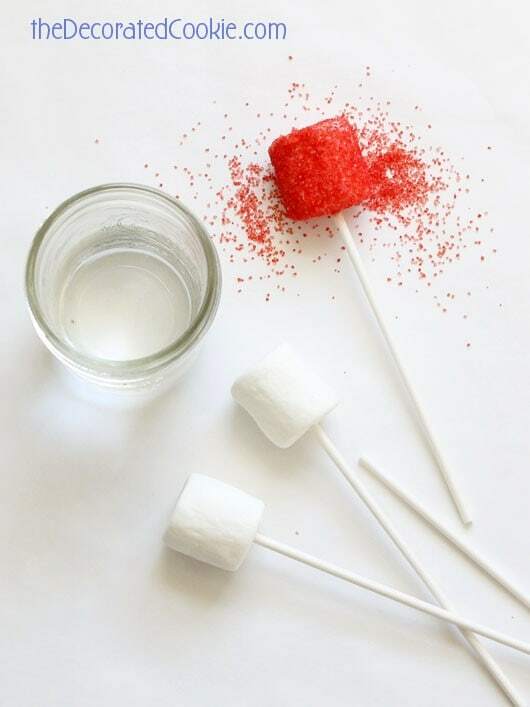 Quickly dip a marshmallow in a cup of water and dab on a paper towel to remove excess water. Hold the marshmallow over a bowl or plate and generously coat with sprinkles. 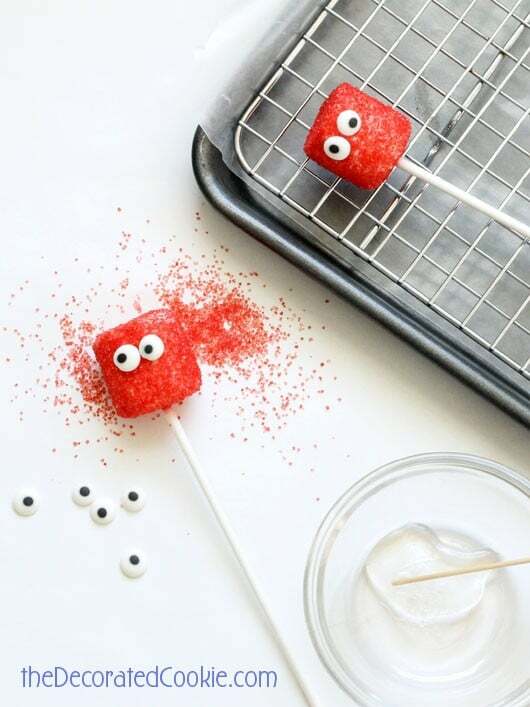 To add eyes, use a toothpick to dab a dollop of light corn syrup on the back of a candy eye and adhere to the marshmallow. Rest on the wire rack to set. 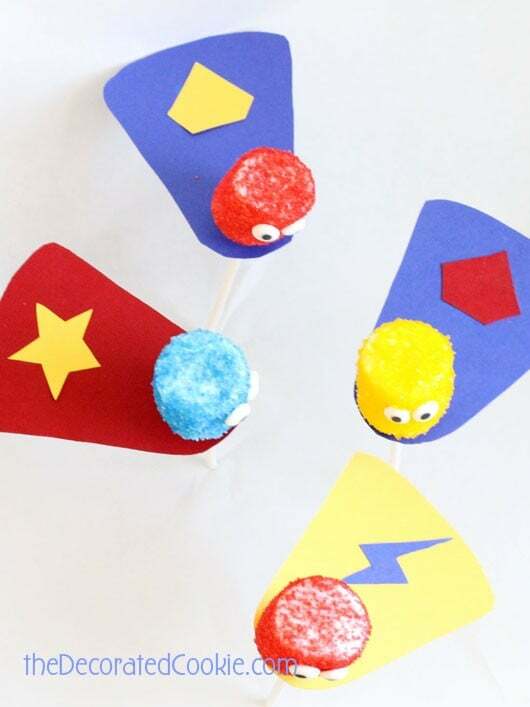 To make the capes, cut out a bell shape from colored card stock. 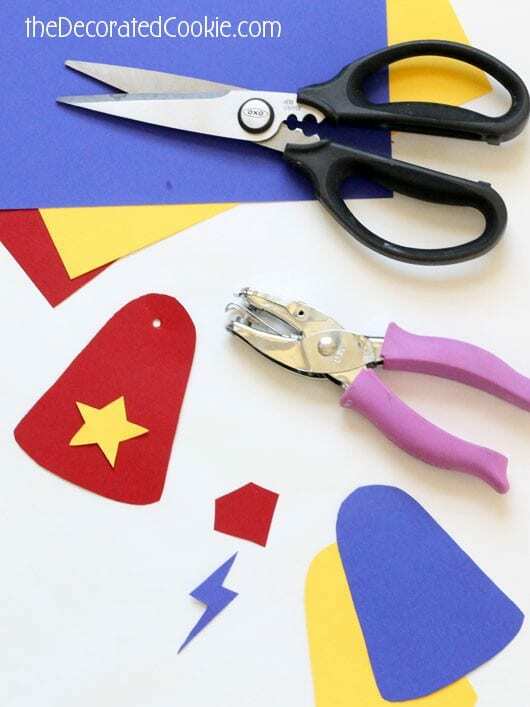 Cut out small shapes, such as stars, lightning bolts or gem shapes and glue to the capes. 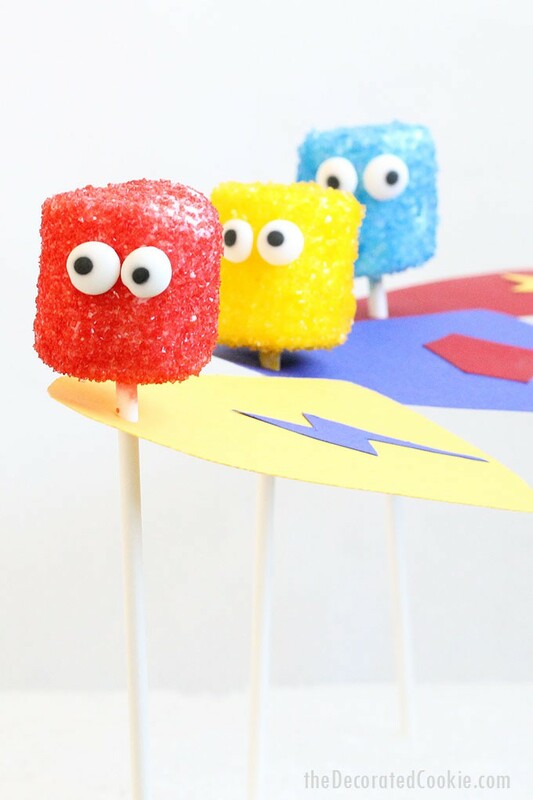 Cut out a 1/8-inch hole with a punch, or, use a needle or scissors tip to make a small hole, and slide the cape on a marshmallow pop. The cape should fit snugly. So ridiculously easy, yet so cute. Love the capes. Wishing my boys were still small ~ but always grandkids!!! can you make this a head of time. like the day before? Then how would you store them? Having a superhero party for my 7 yr old birthday. I think these will be very cute addition. Hi Alice, YES! You can. Somehow the sprinkle coating works to protect the marshmallow inside so it stays soft. I would make them and let them dry uncovered for an hour or so. Then line a large, shallow tupperware with a piece of wax or parchment paper and place them on their sides in there. Cover and ta da. (Of course, I’ve also dumped a bunch of them in gallon size ziplocs and they last fine for days, but just thinking want them to be perfectly in tact for the party). Thanks! 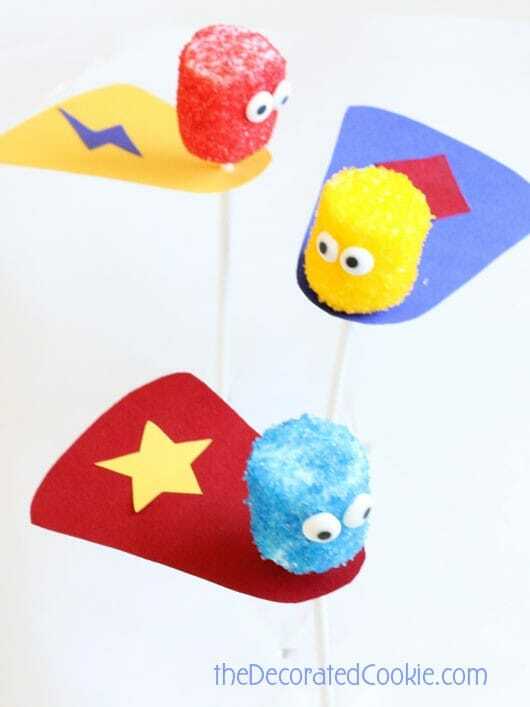 I’m planning on getting children to make these at a camp i’m leading at, i was wondering how much sanding or glimmer sugar you’d suggest to make about 50? Thanks! Hi Jenny, I use the big containers of Wilton “sprinkles” (sanding sugar, they are pretty fine) from Michaels and you should be able to cover 50 with one each of the red, yellow, and blue. However, if kids are doing the decorating, I would expect a lot of waste, especially with the under-10 crowd. So you might be better getting 2 of each. Another thing to consider is buying the big things of sprinkles and then dividing them between different small containers for the kids so there is less arguing/waiting per kid. When I host cookie decorating for kids, I try and have the same number of bags of icing as there are kids. That’s not as realistic for sprinkles since buying 50 little containers isn’t very cost-effective, but definitely as many as you can. That would also discourage waste and limit the kids to the sprinkles they have in reach.